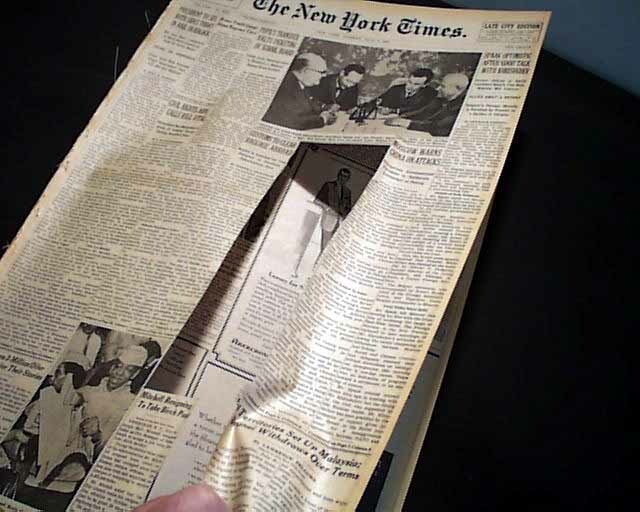 This 64 page newspaper has a some cutouts throughout including the front page. as see in photo. 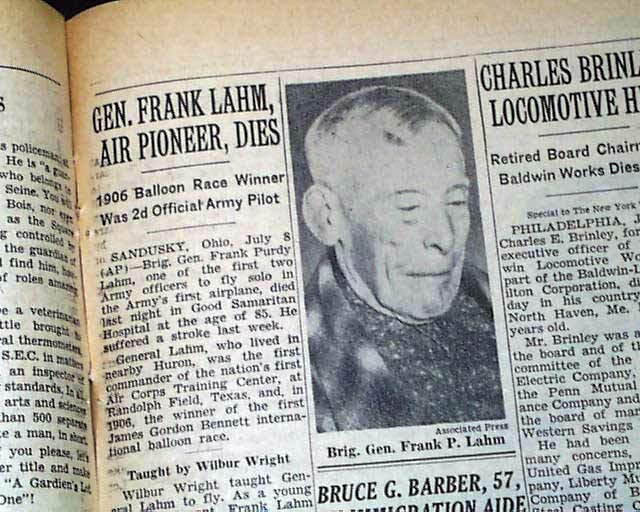 Page 31 has one column headlines: "GEN. FRANK LAHM, AIR PIONEER, DIES"; "1906 Balloon Race Winner Was 2d Official Army Pilot" with smaller subheads and photo of Lahm. 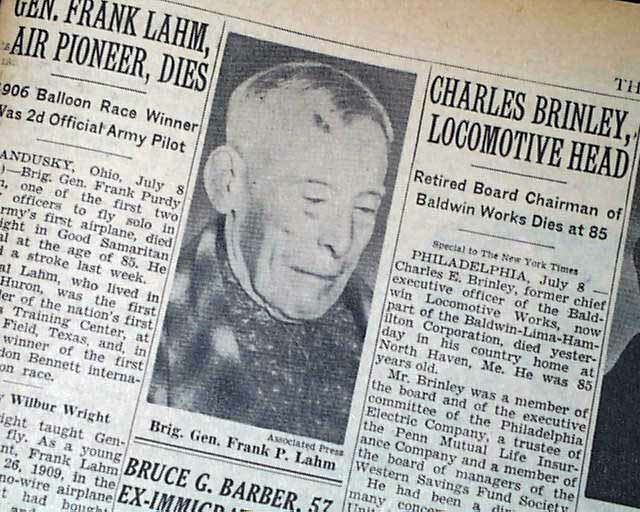 (see) Frank was a aviation pioneer and the very 1st U.S. military pilot. See photos for text. This page is unscathed fro any cutouts. Other news, sports and advertisements throughout. 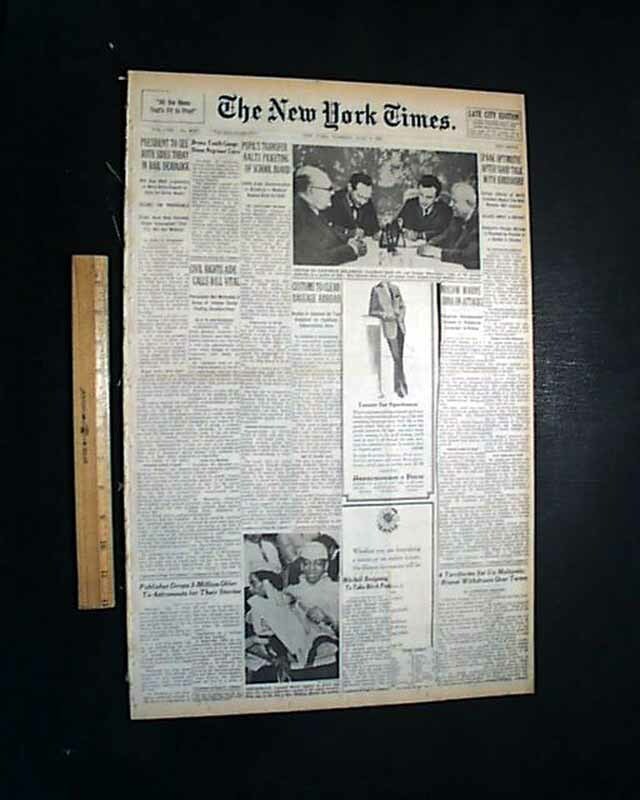 Other than the mentioned cutouts, this issue is in good condition. SOLD AS IS. 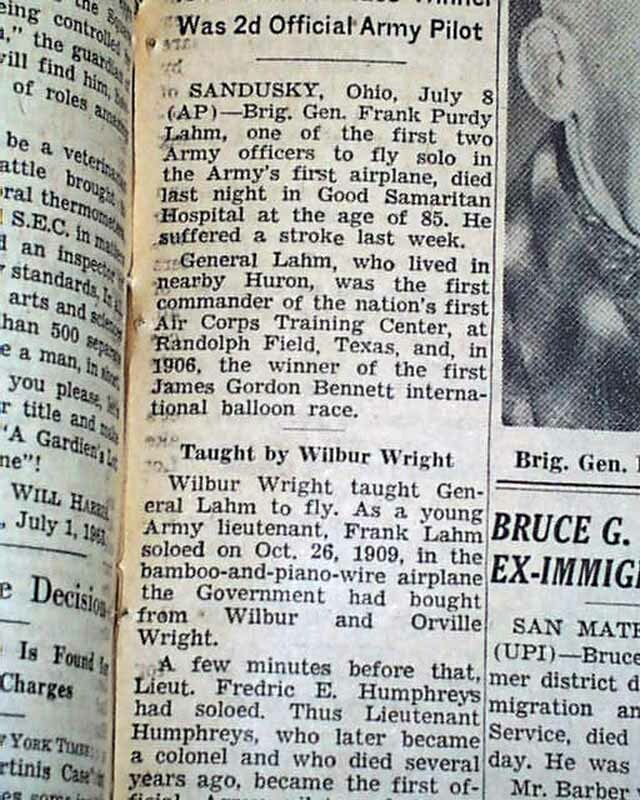 wikipedia notes: Frank Purdy Lahm (November 17, 1877 – July 7, 1963) was an American aviation pioneer, the "nation's first military aviator", and a general officer in the United States Army Air Corps and Army Air Forces. 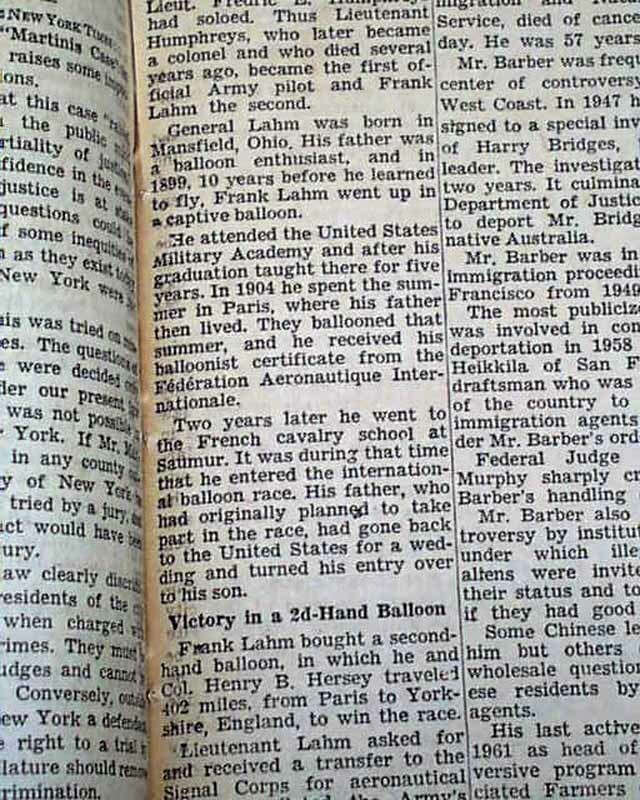 Lahm developed an interest in flying from his father, a balloonist, and received among the first civil qualification certificates issued. 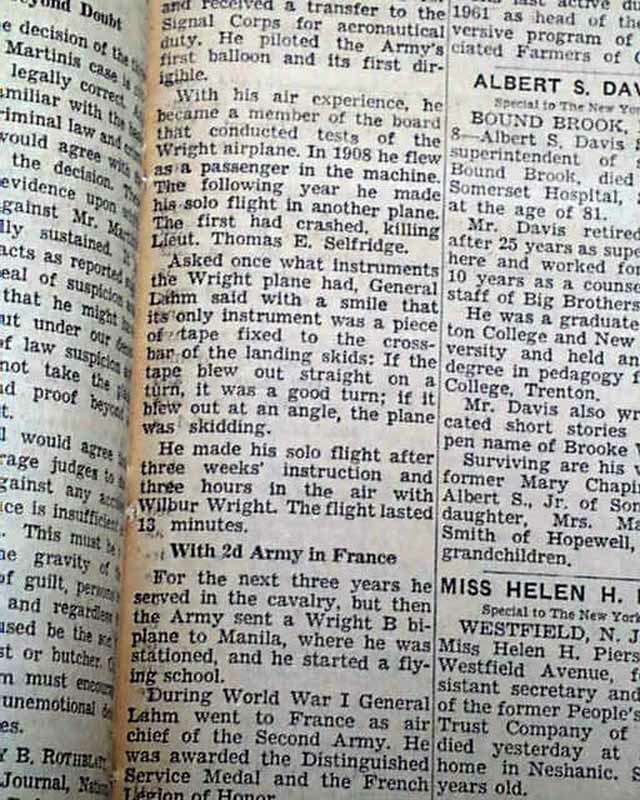 He met the Wright Brothers in 1907 and used his interest in powered flight to become the Army's first certified pilot in 1909, followed four years later by becoming its 14th rated Military Aviator. In 1916 he became a career aviator, serving in the United States Army Air Service and its successors until his retirement in 1941 at the age of 64, rising to the rank of brigadier general. Lahm reached mandatory retirement age on the eve of United States participation in World War II but contributed to the growth of the Air Force both during and following the war. Because of his leadership and administration during its construction, Lahm is also known as "the father of Randolph Field."